He's going to be 11 soon. I can't get enough time with my kids, y'all. This is a problem. What could possibly improve upon a sunshiny day at the park, complete with (free!) live music? Why, hula hoops, of course! 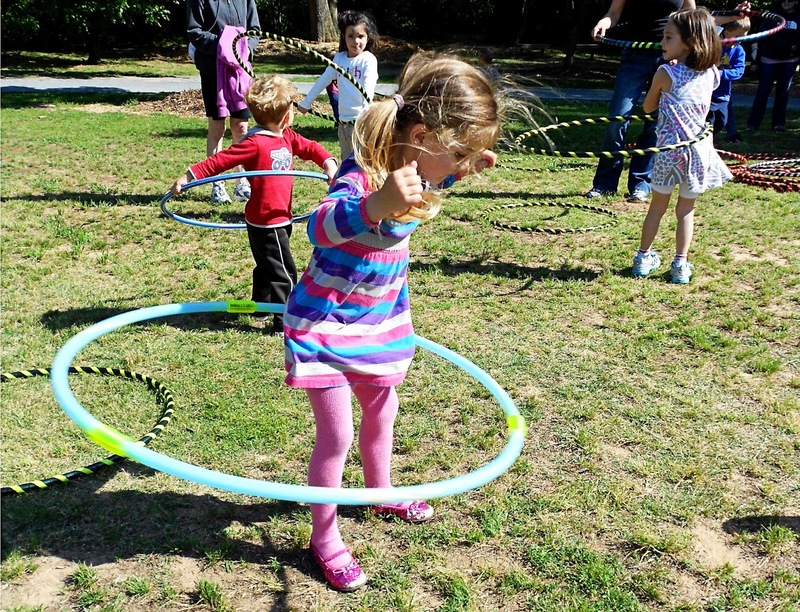 Last Sunday, Alphabet Hoops brought a stack of hoops and joined the fun at "Sunday Funday presented by Wellstar." With such a family friendly atmosphere, there were already a lot of smiling faces, but the hula hoops prompted some happy laughter as well. 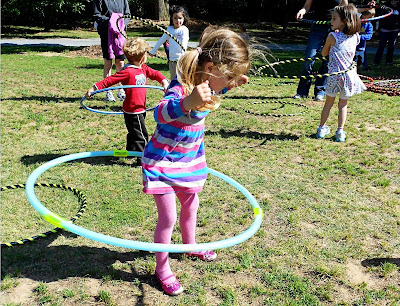 I really had a wonderful time introducing hula hooping to kids and adults. And I really appreciated the occasional references to hula hooping that musician Jay Memory inserted into his songs. He made me smile every time he did that! Remember, Sunday Funday is free. And there's plenty of room for hula hoops. So bring yours, grab the family, and join in the fun! 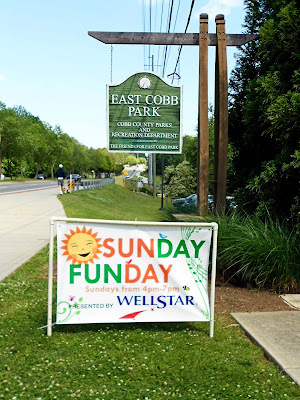 About Sunday Funday by Wellstar: Located at East Cobb Park, Sunday Funday is held weekly on Sundays from 4-7 p.m., April 15 through May 27 (weather permitting). The weekly event features live musical entertainment performed by Jay Memory. Huge thanks to the the various sponsors who make this family-friendly activity possible for our community---Wellstar, Zaxby's, Willy's Mexican Grill, and Rohan Law PC. Today, Jason Bourne, aka “Mr. Marietta,” honored me with the opportunity to teach him some hooping tricks. He is a natural. I am 100% sure that if hooping piques his interest, he will very soon have some isolation tricks to show me. Are you interested in learning some hooping isolations? Here’s an online tutorial that includes instruction for several moves. Many hooping moves have more than one name. In the preceding tutorial, the instructor teaches what she calls a "full moon," "half moon," "shooting star," and "milky way." Watch the video to see what they are! I often teach kids isolations because they're impressive to see and relatively easy to learn. (You should see their eyes light up when I show them the moves!) Personally, I enjoy them because they're a fun way to build some shoulder definition, as well as workout my triceps and biceps. 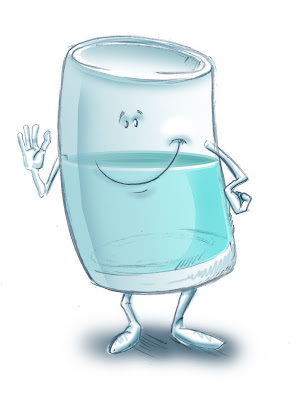 Glass half-full outlook on life. To the extreme. Image by Darren Shaw of Shaw Draw Inc.
You may copy for personal use, but please, please reference his web site. There is such a thing, you know. One's outlook can be so positive that it's annoying to others. Or mildly amusing. This didn't occur to me until recently when I responded to a friend's story with what even I recognized was an unexpected question. Said friend had just moved into an old house one street over from mine. 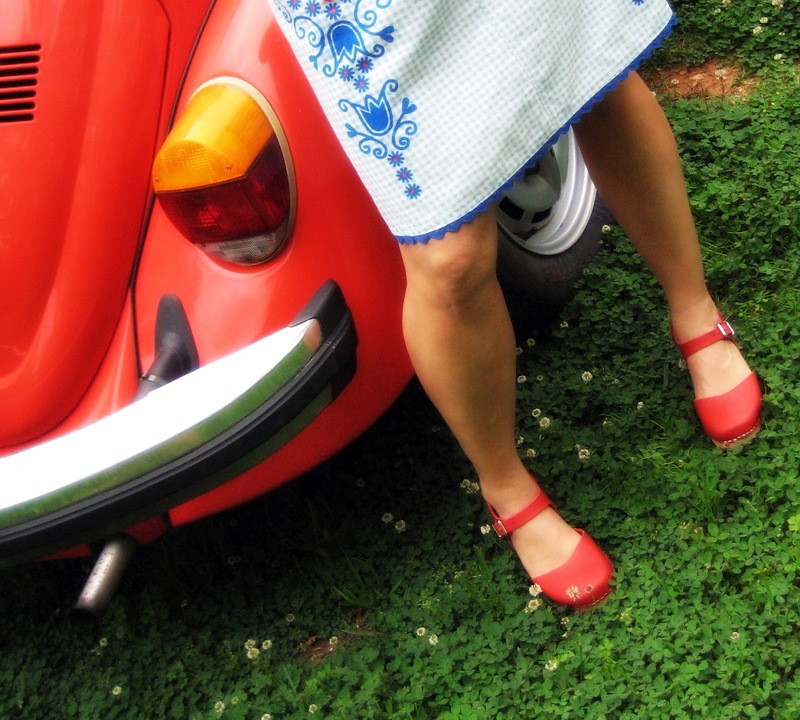 She was young, relatively newly-married and with two little ones hanging onto her apron strings. The gas stove was old. So old that one had to manually light both the stove and the oven. One day, my friend tried to light the oven...nothing happened. A few minutes later, she returned to try again. Yeah. I have some serious Pollyannaism issues going on here. *I asked about my friend's skin because it seemed to me that if the top layer of skin was singed, then it was similar to a chemical peel. Right? No. I know. I'm nuts. p.s. I'm a professional technical writer, not a creative one. My attempts to write not-dry-content is giving me a complex. p.p.s. Coincidentally, Starbucks is giving away free iTunes downloads to the song "Ac-Cent-Tchu-Ate the Positive" by Paul McCartney. I grabbed three extra codes and you can have one! Just leave a comment stating that you've used the code and which one (either 1, 2 or 3). Codes expire on June 12, 2012. So it’s been years since I’ve sewed on a regular basis and I’ve decided that it’s time for me to get that back into my life. First, I needed guaranteed child-free time. This was accomplished by attending Quilt Till You Wilt (at Tiny Stitches in Marietta) on a monthly basis. 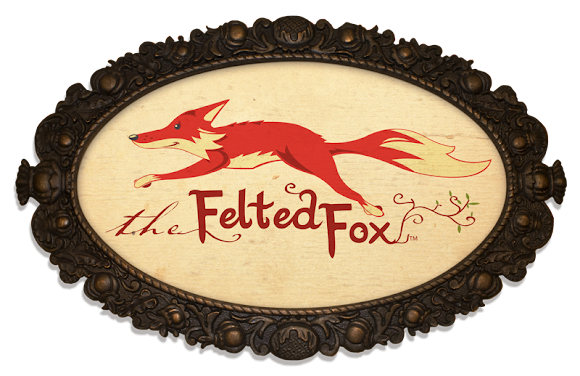 I pay $5, pack up my sewing machine and current project, and skedaddle to their studio for several hours. 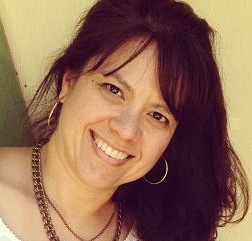 It so much easier to be productive when I can’t hear my kids calling, “Mooooommmmmmm!” all the day long. During my first Quilt Till You Wilt session, I did actually work on a quilt. The last three times, however, I’ve been working on dresses. I really want a closet full of easy-to-wear dresses and that’s something I haven’t been able to find in the ready-to-wear market. The pattern is Simplicity 2203. The fabric is 100% cotton from Joann Fabrics (and I’ve actually seen it at Wal-Mart, too). There are no zippers or buttons. (A top requirement right now as I ease myself into regular sewing projects.) It is an easy dress to make. Really. And it has pockets! Quite cute pockets, actually. There’s a wee bit of elastic which gives them a scrunched up shape at their tops. A very nice detail. Granted, they were the most time-consuming part of the dress and at the time I was attaching them I announced that my next version of the dress would not include pockets. But time and distance are making me re-think that plan. I do believe the extra effort is worth it. 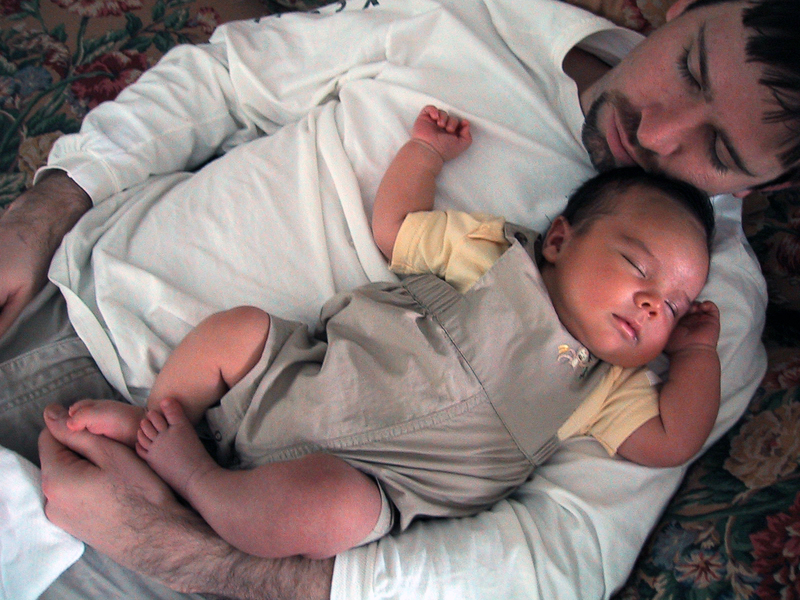 Plus, I always like having somewhere to rest my hands. The pattern instructions say to use binding as the neck tie, but I created a tie out of the same fabric as the dress. I thought the binding option made the dress look more homemade than necessary. Here’s the side-view. Notice the super long bow…I still need to shorten and finish off the tie. Without a belt, the dress is an unflattering a-line on me. 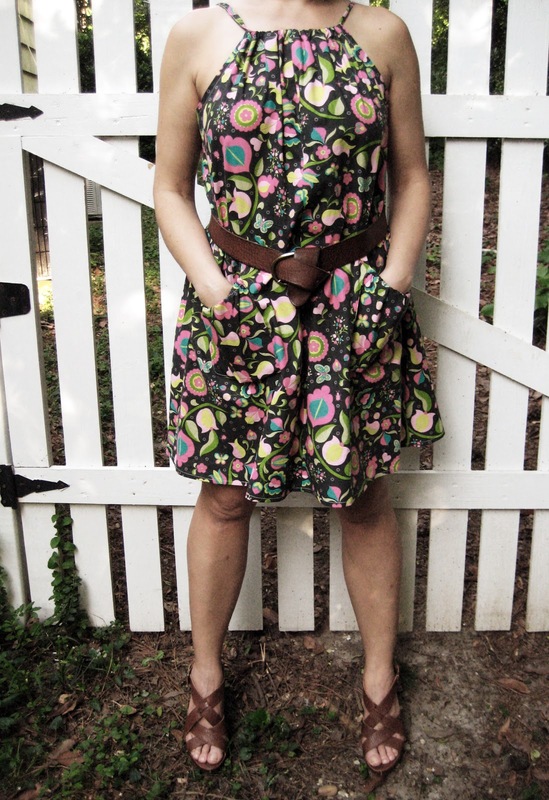 With a belt, the dress is semi-flattering. (I carry most of my weight in my middle. That combined with my relatively slim arms and legs result in unfitted dresses making me look pregnant.) It hung in my closet for days before I got around to trying it with a belt. I came very close to giving it away because I could tell the shape was not a good idea for moi. Now I’m glad I didn’t. And, yes, I shall make another one. Perhaps after I finish the next two dresses that I’ve got lined up. Lotta From Stockholm products are also available at Amazon, but my clogs were cheaper when purchased directly from Lotta, even with shipping factored in. *Yeah. I know. 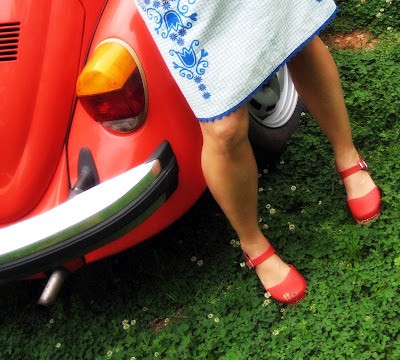 Although clogs are found worldwide, they are not generally associated with Switzerland. And to add another reference from that neutral country, clogs also make me think of Swiss-style cuckoo clocks. Go figure. I first learned about smoothies as a student at Florida State University (Nature’s Way Restaurant…ah, how I miss you and your menu!) They’re quick, easy, as nutritious as you want to make them and (most importantly for kids) yummy! Put all ingredients in a blender. Blend until smooth. Serve. Done! You can substitute any liquid you want for the milk (almond milk, soy milk, apple juice, pineapple juice, etc.) and replace the banana with any combination of frozen fruit. In the Cappuccino Banana Smoothie pictured above, I used 1/2 cup coffee, 1/2 cup milk and 1 frozen banana. Oh! And 1/4 cup ground oats. Really, a smoothie’s ingredient list is only limited by your imagination. A note about the frozen banana---I peel my over-ripe bananas and put them in the freezer for smoothies. Some people leave them in their skins, but I think that's a pain...perhaps that works best for banana bread when it has to be defrosted anyway, but I prefer to freeze my bananas peeled. I also slice the frozen bananas before putting them in the blender. I recognize that there are inherent dangers to this approach, but I've got a method that's fairly safe. You, being wiser than I, may choose to slice the bananas and then freeze them. Totally up to you! Here's a pretty (and easy!) 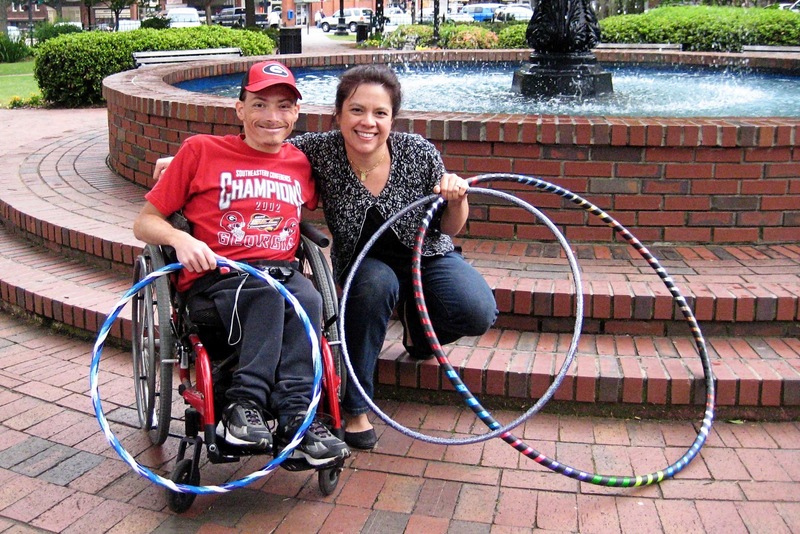 move to add to your hoop dance routine. Betty Lucas calls it the "Butterfly." It looks best when done slowly, but I'm sure more advanced hoop dancers could make a frenetic pace look good, as well.